ID309 Desire - Diamonds,This exquisite closed weave ring is a real head turner,expressing the ambition and longing for all you are passionate about in your life. This exquisite closed weave ring is a real head turner; expressing the ambition and longing for all you are passionate about in your life. 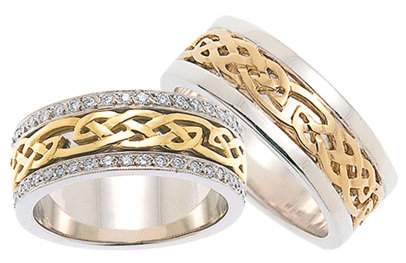 Any combination of white, gold or rose golds. Rings with diamonds has .2ct pave diamonds. All products sent within Australia are sent through Australia Post, free shipping for orders over $500. Please feel free to call or e one of our friendly staff members anytime for further information and personalised service. 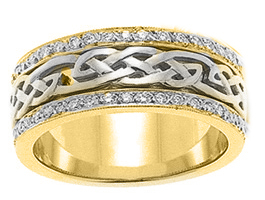 ID124 - Shamrock and Trinity Knots,This stunning ring is new to our collection. It has shamrocks and trinity knots. Made in Ireland. ID204 Warrior Shield - Ladies Narrow,This stunning ring incorporates a design that is thousands of years old. ID205 Classic Claddagh ,This beautiful ring is a classic design for a wedding or dress ring while also incorporating the Claddagh symbol, which means “Love, Loyalty and friendship”. ID105 Warrior Shield - Ladies,This stunning ring incorporates a design that is thousands of years old. 14ct Yellow gold weave, white gold trim.